The rising generation of landscape professionals and gardeners are getting their fair share of attention from such varied sources as the Facebook Group ‘Emergent: A Group for Growing Professionals’ and Dee Nash’s new book, 20/30-Something Garden Guide. But the “Olympics of Landscaping” for the past 38 years has been Student Career Days organized by PLANET, the national trade association representing landscape professionals. Student Career Days (SCD) comprise the “National Collegiate Landscape Competition", a career recruitment event for college students studying horticulture and landscaping. This year, the University of Colorado will host SCD on March 23-24, 2014. To celebrate the three year milestone for #Landscapechat, the live tweetup has been scheduled for Friday, March 21 chat at 10 am PT / 1 pm ET at SCD. Students and the industry can learm more about SCD during the chat, a valued resource that brings students and companies together to build a strong industry for the future. Students who add Landscape Industry Certified to their resumes demonstrate added value that employeers want. The live chat begins on a special day and time: Friday, March 21, 2014 at 10 a.m. PDT / 1 p.m. EDT, where we come together with green industry experts and fellow landscaping peeps each week to discuss all things related to landscape, since 2011. Join @CoronaTools and #landscapechat co-partner, Lisa Schaumann, PLANET Director of Public Relations @PLANET2005 for this week's topic: Student Career Days. What is SCD? 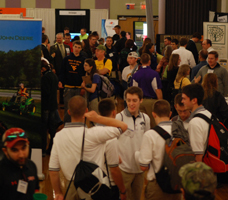 Student Career Days (SCD) is the “National Collegiate Landscape Competition", a career recruitment event for college students studying horticulture and landscaping. This year, the University of Colorado will host SCD on March 23-24, 2014. The Twitter hashtag for the event is #PLANETSCD for up to the minute information. A Photo Album shows many aspects of the event from past years. We have nearly 75 companies from all over the country participating in our Career Fair! They are all looking for qualified employees for full-time positions and internships. Students and faculty should take this opportunity to meet as many companies as possible, and make those all important connections. Students should come prepared with resumes and be ready to interview on the spot. Student Career Days features a series of competitive events designed to challenge students based on current industry standards. Each competition is coordinated by green industry companies — they design the competition, they set it up, and they judge it — so the competitions are as true-to-life as it gets. See how you compare amongst students from across the country! How do students get jobs through SCD? Why is it important for the industry to support students? Lawn, landscape, tree care, and irrigation companies struggle with a shortage of well-educated potential employees. Because of that shortage, nearly 100 percent of students graduating from college horticulture and landscape programs have jobs offers. Student Career Days brings students and companies together to build a strong industry for the future. Student Career Days is sponsored at the Platinum level by STIHL, Inc.
Do students get scholarships at Student Career Days? The annual event also includes the awarding of tens of thousands of dollars in scholarships presented each year by the PLANET Academic Excellence Foundation (PLANET AEF). Don’t miss out on this exciting topic as we welcome PLANET to the #Landscapechat community! Just sign into #landscapechat Nurph with your Twitter ID and you can follow the conversation and share with the community. It will automatically add the hashtag to all your tweets too.